Ubiquitous Quantum Dots (UbiQD) Inc., a Los Alamos start-up company, has launched the commercial sales of its new invention, “UbiGro” greenhouse film: a red light emitting window film that is a ground breaking advance for greenhouse production. 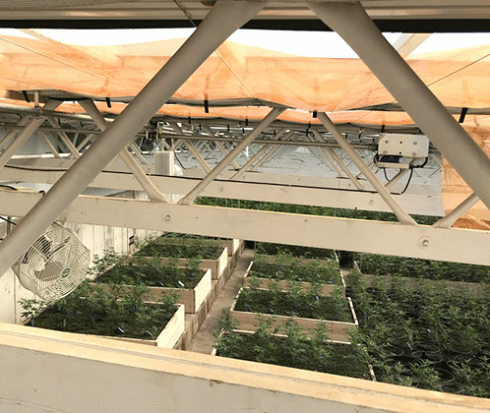 UbiQD researchers have been testing this product in the New Mexico Consortium (NMC) greenhouse and commercial settings for the last year and a half. They have found that greenhouses covered in this film can boost crop yields by 10 percent or more. How does it work? The film uses quantum dots to shift sunlight into a red-light emitting spectrum that mimics late summer sun year round. Late summer sunlight is considered the most potent time of year for plants because they sense winter coming and grow faster, said UbiQD CEO Hunter McDaniel. UbiQD now sells rolls of quantum-dot-coated film as a simple retrofit that attaches to any existing greenhouse.